The exhibit will be on view to the public, July 21st – August 7th, 2016. Philadelphia born contemporary artist Al-Baseer Holly recently transitioned from being a full time musician to focusing on the aesthetics of art, using that canvas as a visual recording of emotional storytelling. His work is created from nostalgic scenes of his adolescence which he refers to as “Childhood Access Memories”. Recreating these moments gives him the ability and opportunity to relive and re-invent the instances that have influenced his growth as an overall artist. Musically influenced, his painted canvases aptly named “Bars”, derive from traditional formatting of vocal instrumentation, allowing him to consistently create a visual song that excites viewers. Al-Baseer’s work consists of a bold subtlety that presents a formal interpretation of his message. 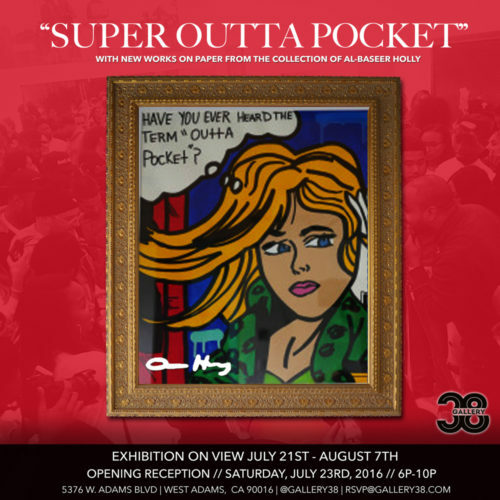 His new series of works on paper titled “Super Outta Pocket” introduces the viewer to a look at how language plays it role in today’s relationships. Using slang familiar to his Philadelphia upbringing, Al-Baseer is hoping to institute a higher level understanding of young urban relationships through conversation.